BOND: Revisiting TOMORROW NEVER DIES | Warped Factor - Words in the Key of Geek. Never underestimate the power of the press, says Tony Fyler. 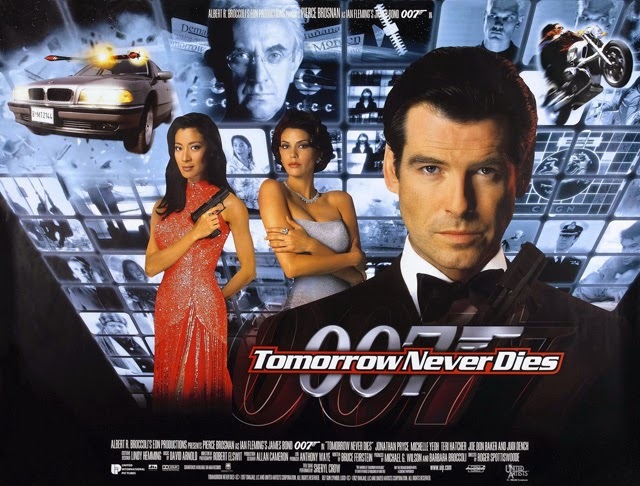 While Pierce Brosnan’s first Bond film, Goldeneye, announced a shift in the world’s perception of Big Bads from shady supervillains and Russian dogmatists to those within the Good Guys’ system who’d been left behind or overlooked, Tomorrow Never Dies followed up with a delicious slice of popular conspiracy theory – that the media could be used to dictate events, rather than simply reporting on them. To be fair, the world had all too recently been a battleground between at least two high-profile media moguls, one of whom swindled a pension fund and took a swan dive off his own ship, and the other of whom now owns Fox News, so the idea of global media barons as the new faces of evil in the world had some populist legs to it. What’s more, in the split between serious, gritty Bond movies and those that you just watch for the fun of it, Tomorrow Never Dies is Pierce Brosnans’s first entry into the latter category, two hours of Bond-flavoured popcorn that you realise is bonkers from at least the first post-credits sequence, but that you just go with because it’s such insane fun. Jonathan Pryce turns in one of the most over-the-top performances both in his own career (pretty much rivalling his intentionally comic take on the Master in The Curse of the Fatal Death), and in the history of Bond villains as Elliot Carver, media baron able to reach and influence every human being on the planet… except the gazillion or so in China, thanks to that superpower’s reluctance to grant him broadcast rights. The degree of convoluted palaver he’s willing to undertake to stop that being a factor is inherently lunatic – but to some extent, that’s what you’re looking for in a Bond villain. It’s true that Pryce’s Carver is so obviously loopy that you do rather lose respect for him, and the believability of his cool, calculating brain is rather tempered by speeches that begin with dancing batty villainy like ‘Good morning, my golden retrievers – and what havoc shall the Carver Media Group cause in the world today?’ Nevertheless, Pryce’s supervillain is exquisitely watchable because he’s the epitome of the spoiled child with too much power – his certainty that bad things never happen to him, but only to those he deems they should happen to is positively puerile, and his claim to love his wife combined with the ease with which he arranges her murder for what seems like a very venal sin (knowing Bond intimately from a time before he himself was on the scene) shows classic signs of an egomania which, against all the odds, gives a kind of validity to the grandiosity of his utterly bonkers underlying plan. Terri Hatcher’s Paris Carver is a noble stab at ‘the Bond girl that really matters,’ but the idea that she got ‘too close to comfort,’ causing Bond to do a bunk is delivered though very much by exposition, rather than by any evidence of chemistry between the two (side-note – what is with Brosnan’s kissing style in this movie – it’s all teeth and biting, like some vampire-obsessed teen) and we find it surprisingly hard to care when TV’s Lois Lane dies. Michelle Yeoh on the other hand delivers in spades as Wai Lin, bringing the kickassery in a performance that could have seen her character develop further had the mood and the stories been right. The set pieces are delivered here with a degree more fun than in Timothy Dalton’s era, or indeed in Goldeneye, and it’s also quite a departure to have the first such sequence (pre-credits) delivered to a watching audience of British Intelligence/Service personnel, giving an additional point to Bond’s generally showy grandstanding – the heroics in the pre-credits sequence are Bond very specifically doing his job, killing lots of people in order to save rather more. The scene is a great combination of Bond-age – fighting his way through a terrorist Wal-Mart to a plane loaded with nuclear missiles and then getting that plane out of the way before an entirely different missile blows the place sky high – and Service reaction (Judy Dench as M and Geoffrey Palmer as Admiral Roebuck, fantastically biting to one another after swapping small-screen sitcom dueling for big-screen spy films), even if it does include the sliiiightly fanboy ‘Get out of it, James’ from Colin Salmon’s Robinson. The post-credit non-Bond set-piece that sets the whole plot in motion – the sinking of the HMS Devonshire was pure sci-fi at the time Tomorrow Never Dies was released, and as such, was madly Bond-like in the scale of its ambition. Nowadays however, if you want Bond-flavoured nightmares about the kind of stunt that Carver and Gupta pull with the Devonshire, Google ‘gps spoofing Todd Humphreys.’ Don’t say I didn’t warn you though – you may never sleep again. The remote-controlled car chase is Pierce Brosnan’s Bond to an absolute tee – it’s Bond as a boy with a really cool toy, and it’s possibly the most fun the character is shown to be having in almost thirty years, from the dawn of Dalton through to the current Craig incarnation. It’s also of course an excuse to both show off all the new car’s tricks, and then spectacularly, comically, trash it, possibly causing Q to have some kind of cardiac episode. Bit of a wasted opportunity? Maybe, but it’s also the Top Gear version of a Bond car chase – Power! Gadgets! Jumping Off A Roof! Yessss! Asinine, possibly, but terrifically good fun to watch. The halo jump to the Devonshire actually gives the biggest clue to the tone of the movie – it’s a slice of Roger Moore Bond, incongruously stuck in an era which thought it was done with Moore’s particular style (while the fact that Wai Lin is already down in the Devonshire wreck speaks another volume on her kickassery and equality with Bond – she’s actually less a Bond girl than he is a Wai Lin boy here, and fortunately, Brosnan and Yeoh get to play it more as equals than previous decades would have allowed, making the film significantly better as a result), while the banner drop and handcuffed bike chase is Bond on cocaine – the improbability factor is cranked way past eleven and into the ‘critical silliness’ red, but still, it’s fantastically shot and edited, so you happily suspend your disbelief and go with it. Tomorrow Never Dies is fantastic, silly, high-octane Bond with more than a slice of Roger Moore-style cheese melted into the 90s mix. After a late-eighties, early-nineties experiment with gritty realism and almost tortured characterization in the Dalton Bond movies and Goldeneye, it’s an unashamed throwback to Bond as popcorn. It’s also in some ways the last-but-one of its kind to date – The World Is Not Enough was almost as loopy, and its ultimate objective in some ways even sillier than that of Tomorrow Never Dies, but there’s a touch of Stockholm Syndrome that darkens is overall tone, and from Die Another Day on, the franchise reverted more and more to dark, gritty Bond-age in the tone more of Dalton than of Brosnan. That being said, if you want a Bond movie that’s truer to both the Moore flippancy and in some respects to the Connery original, Tomorrow Never Dies still offers more than value for money, its madder-than-mad villain, its dafter-than-daft set pieces, and its fundamental popcorn quotient making it more fun to watch than any subsequent Bond movie till at least Skyfall. Stick it in your DVD player today and remind yourself of the long Bond tradition of not taking itself too seriously.